In the world of literature, there are many ways in which writers express their emotions or experiences. Some writers merely use literature to teach a lesson to the readers or to spread awareness about a certain situation or problem. Most of the times, the stories that authors write are long and detailed. Though there are people who like everything to be explained properly with even the smallest of details emphasized upon, most of the people would prefer a shorter version that delivers the message intended by the writer. In addition to this, when famous novels written by famous writers, such as Great Expectations by Charles Dickens, are to be included in the primary schools’ literature curriculum, it is not possible to include the novel as it is. The length as well as the level of literature is not easy for the primary school student to understand. Therefore, certain ways are used to shorten the text. The most common way is to use an abridged form of the book which is just a shorter version of the book without losing the actual sense or message. In some cases, an even shorter version is required and that brings us to the main idea and theme. These are some of the shortest versions which are taught to even primary school students. The main idea is what we can call the overall idea of the passage or a text. It is very closely related to the Topic of the passage and in some cases directly stated in the topic sentence of the text. This is usually the case when we are considering short pieces of text. Moreover, the main idea usually comes from the plot as well as the characters of a plot. It is not difficult to identify the main idea of a plot; it can be as simple as identifying the subject of a given paragraph or the most important detail or event of a chapter of a novel. On the other hand, the theme is the central topic that a text has. There are two main categories of themes; thematic concept and thematic statement. The former is what the readers think that the work is about, whereas the latter is what the work says about the subject. Identifying the theme can be very simple; it may even be possible to sum it up in just one word such as love, betrayal, death, fear etc. It can be easily said that the theme involves the main concept or the lesson learned from the story. For example if the story is about a person who fails at something due to not being careful, then the theme is merely the consequences of being careless. A very important difference between the theme and the main idea is that the main idea of a story may be unique in most cases. This means that the main idea behind the story is only provided by that story and will be unique most of the times although not always. In contrast to this, the theme is never unique. If the theme is love, there are countless stories with the same theme. Moving on, the main idea can or cannot be directly stated in the text. For example, the main idea of a short story may be found in the first paragraph as the topic sentence. The theme, however is only seldom expressed in words within the story. It goes beyond chapters and paragraphs. To understand the theme, one needs to read and comprehend the entire story. allana. 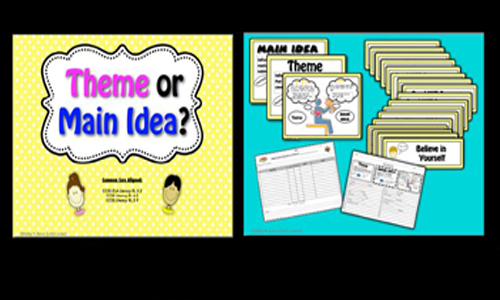 "Difference between main idea and theme in literature." DifferenceBetween.net. June 8, 2016 < http://www.differencebetween.net/language/difference-between-main-idea-and-theme-in-literature/ >.